An early advertisement from the Manchester Directory (approx. 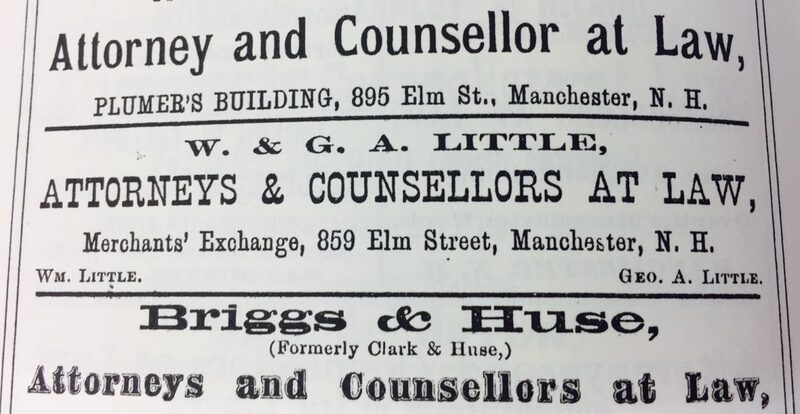 1870) listing William Little's law firm. Photo courtesy Manchester Historic Association. In 1869, a prominent Manchester lawyer by the name of William Little – a well read man with an office right on Elm Street and a deep interest in Meteorology – found himself in the position of being able to make a deep and historic contribution to Mount Washington history. Though he didn’t know it at the time. In a casual conversation with New Hampshire’s assistant geologist, a young, eager scientist by the now-recognizable name of Joshua H. Huntington, Little learned that Huntington had been unable to secure the mountain’s Tip Top House at the summit for a winter expedition. As it happened, Little, from Warren, N.H., owned a chunk of property in Benton that happened to include the summit of Mt. Moosilauke. Little wasted no time offering Huntington free use of the stone hotel at the top of Moosilauke, Prospect House, for a full winter expedition – the first time a science expedition stayed at that sort of elevation through a heavy winter and a trial run for the following year. Using the photos, notes and information gathered from atop Moosilauke, in 1870, Huntington was able to take a team up to the summit of Washington, the first of its kind. Little continued to practice law and engage in his love of science until he passed in 1893. Dan Szczesny is a long-time journalist and author living in New Hampshire. His books include The Adventures of Buffalo and Tough Cookie, a hiking memoir about a one year, 225-mile journey through some of New Hampshire’s least known wilderness with his 10-year-old foster daughter. Also, The Nepal Chronicles, about a month long trek to Everest Base Camp and marriage in Kathmandu. His first collection of fiction, Sing and Other Short Stories, and includes a variety of short fiction spanning Dan’s 25 year career as a writer and journalist. His latest book, Mosquito Rain: Alaskan Travel Essays is an illustrated travelogue of Dan and his wife’s journey to discover the true meaning of the Last Frontier. Dan is also the Editor of Murder Ink, a series of New England-based Pulp Fiction anthologies set in or around the newsroom. Volume Three is set for release in 2018.